The cozy and eclectic atmosphere of Pressed will be the home of our first offsite On View event. JustJamaal ThePoet hosts a showcase featuring some outstanding young artists including poet Nina Vuleta, the youngest Capital Slam Champion and singer/musician Mia Kelly who will perform to a new video work by Randy Kelly. You can expect a dynamic performance by Jamaal and Golbon Moltaji will mix up some music for us during the evening. 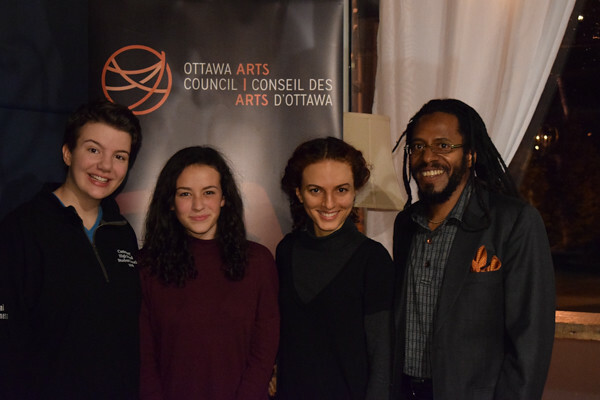 Expect to get to know more about the Ottawa Arts Council and its Awards program including the announcement of a new Young Artist Award. This is an all ages event with no admission charge, but please reserve your ticket here. Nina Vuleta is a 15-year-old poet from Ottawa. She started writing at the age of twelve-ish and has since then competed in various slams around the city. In 2015, Nina as named the youngest Capital Slam Champion and went to CFSW (Canadian Festival of Spoken Word) that same year. Apart from poetry, she also enjoys dance, drama, and reading the Wikipedia page of Neil Patrick Harris. Mia Kelly is 14-year-old singer who accompanies herself on piano and guitar. For the last six years Mia has been involved in numerous musical theatre productions and has been performing both solo and in a band. Golbon Moltaji is an artist, illustrator and a PhD candidate in social sciences at the University of Ottawa. She is originally from Tehran, Iran and moved to Canada to pursue a master’s degree in 2009. Golbon is currently working on a comic series “Stories from Ottawa” and a digital installation project that employs her drawings as a set of aesthetics to go with her DJ music. When mixing she enjoys morphing through deep, moody and dark snares of minimal techno, ambient and trip hop music to samples of Persian instrumentals and even original sounds she has recorded off the streets of the cities she has traveled to. John Akpata isSpoken Word Artist based in Ottawa Ontario, Canada. John has won awards and competitions, and has toured nationally and internationally. John is also asuccessful recording artist,having released 5 recordings of poetry and music. John's work has also been featured on compilation recordings, documentary films, and The Great Black North anthology of contemporary African Canadian Poetry. John is the host of Monday Night Scribes, a weekly 1 hour broadcast dedicated to writers, reciters, MCs, and poets. John has live guests on air to discuss their work, and the art of writing and performing. John plays Spoken Word recordings, as well as HipHop, Reggae and World music. Jamaal Jackson Rogers: stage name JustJamaal ThePoet, is a professional artist, creative entrepreneur and arts educator. As an artist he is a poet/writer, spoken word practitioner, rap emcee and stage performer. As an entrepreneur he is the Director of Fly Poets Society and Make Spoken Work Go Viral; creating urban arts events in Ottawa for patrons to enjoy. In the past three years he has brought his energy and message of art culture to audiences of diverse background and interests. His defining moments are when he makes intimate connections with his listeners during his workshG101 in partnership with BRAVO presents Fragile | G101 en partenariat avec BRAVO présente Fragileop and performance sets.